I’ve been reading your prediction that Republicans will simply find a way to overturn any built-in cuts to defense spending. With Obama’s veto threat, do you still see things the same way? then again, he doesn’t usually make flat-out veto promises either. So maybe this time is different. But I’m not sure it matters. Here’s the only thing that’s really important: the defense cuts don’t kick in until 2013. In other words, not until after the 2012 election. And let’s face it: all bets are off at that point. Maybe president Gingrich will be in charge then. Maybe Obama will win and cut a deal with the lame duck Congress, like he did last year. Maybe we’ll be in the middle of a war with Ubeki-beki-beki-stan. Who knows? A year in politics is a long time to begin with, and a year plus a presidential election is like an eternity. Basically, after everyone has finished up wailing about the fecklessness of Congress and moved on to some other shiny new object — a process that should take no more than a week — the whole thing will be forgotten. When it’s suddenly thrust back into the spotlight next December, we’ll be living in a whole new world. Anything could happen. Still, the smart money says that “anything” doesn’t include very much in the way of cuts to the defense budget. 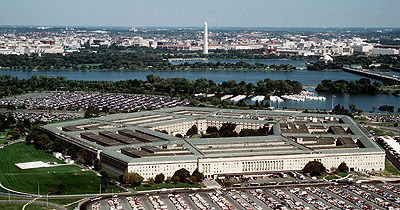 There’s just too much institutional and political pressure to keep money flowing to the Pentagon. No president in recent memory has stood up to it, and I doubt that Obama will be the first.